I like making this Applesauce Bread, especially when I have homemade applesauce on hand. It is the kind of bread where you can walk into the kitchen and, in no time at all, have it baking in the oven. 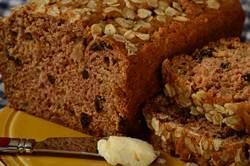 This quick bread has a great apple cinnamon flavor, a moist texture and, as a bonus, it's relatively low in fat. Sometimes I enjoy a slice for breakfast covered with a layer of butter and marmalade. For lunch it makes a nice accompaniment to a salad or a bowl of soup. And if you have any bread left over, you can cover and store it for several days at room temperature or in the refrigerator, or it can be frozen. As with many quick breads, Applesauce Bread is mixed by hand, no electric mixer is needed. You only need two bowls, one for the wet ingredients and one for the dry ingredients. Mix the two together and you are done. This bread is really quite healthy. For one thing it uses both all purpose flour and whole wheat flour. And while applesauce adds both flavor and moisture to this bread, did you know that applesauce also allows us to use less fat? (You can use either homemade applesauce or store bought and I prefer to use either lightly sweetened or even unsweetened applesauce.) And speaking of the fat, we only add 1/4 cup (60 ml) and it's in liquid form (vegetable, corn, canola or safflower oil) which reduces the saturated fat, although you could use an equal amount of melted butter if you prefer. The batter also contains either plain yogurt or sour cream (your choice) and you can use either full fat or reduced fat. Ground cinnamon is added as it always pairs well with applesauce, with the added bonus of coloring the bread a lovely honey brown color. Before popping the bread into the oven you can decorate the top of the spread with a sprinkling of rolled oats or chopped nuts. Applesauce Bread Recipe: Preheat oven to 350 degrees F (180 degrees C) and place the oven rack in the center of the oven. Butter (or spray with a non stick vegetable spray) the bottom and sides of a loaf pan (9 x 5 x 3 inch) (23 x 13 x 8 cm). In a large bowl, whisk together the flours, baking powder, baking soda, salt, and ground cinnamon. Stir in the currants. In another large bowl, combine the beaten egg, applesauce, oil, yogurt, sugar, and vanilla. With a rubber spatula or wooden spoon, lightly fold the wet ingredients into the dry ingredients just until all the ingredients are combined and moistened (do not over mix or the bread will be tough). Scrape the batter into the prepared pan, smoothing the top with the back of a spoon. For garnish, you can sprinkle the top of the bread with 2-3 tablespoons of rolled oats or chopped nuts. Bake for about 45 to 55 minutes, or until the bread is golden brown and a toothpick inserted in the center comes out clean. Remove from oven and place on a wire rack. Let cool about 10 minutes before removing from pan. Lovely served warm or at room temperature. Can be stored in an airtight container for several days at room temperature, or it can be frozen.